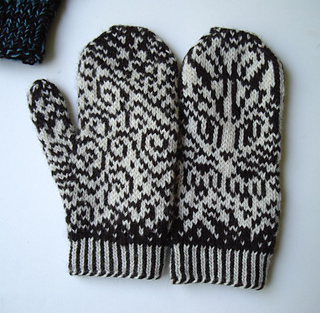 At the very end of 2011, sarah-marie was muttering the song “Favorite Things” (Pomplamoose’s version) to herself and accidentally heard herself think, “… and whiskers on mittens…” She then realized that this should be a knitting pattern. So she sketched part of a chart, and then remembered that she doesn’t know how to draw. 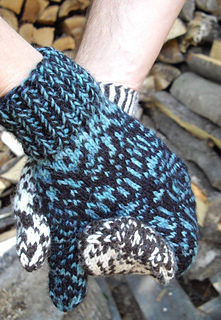 Therefore Madison took over, because she does know how to draw, and Whiskers on Mittens was born. 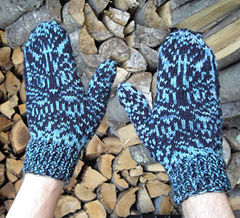 These mittens may be made with any light worsted or DK-weight yarn that you can get to knit at 6 stitches/inch in colorwork. You will need approximately 110 yds (101 m) of the background color and approximately 75 yds (69 m) of the whisker/kitten color. 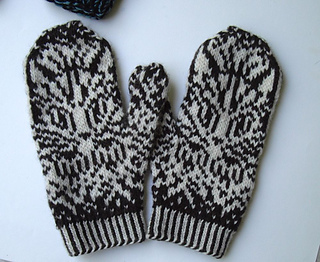 Your needle size may vary from the stated size 4; a tight knitter will probably use size 6 needles. 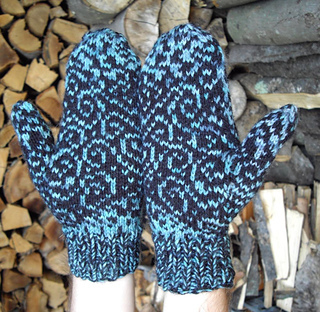 There is an optional decorative cuff that uses size 2 or 3 needles. 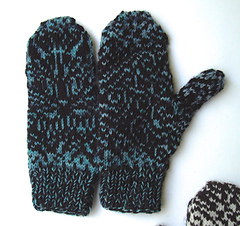 For larger or smaller mittens, use heavier or lighter yarn (and correspondingly different-sized needles). 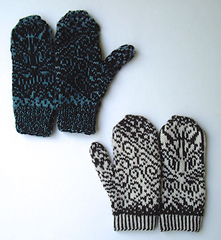 Stitches and techniques needed: knit, purl, make 1, knit two together, slip slip knit, grafting (kitchener).